Surrounded by scenic mountain views and close to the pretty resort of Agia Efimia, Villa Joanna is a jewel in Kefalonia's crown. The countryside setting is sure to help you unwind, and the villa location is a great base from which to explore the north of this beautiful island. Head through the valley to the Myrtos Beach, famous for its stunning scenery, or drive up to Fiskardo and visit the Venetian Harbour. This 3 bedroom villa is spread over 3 floors, with a private pool and plenty of balconies to relax and admire the views from. WiFi and air conditioning/heating in the bedrooms and lounge is included. 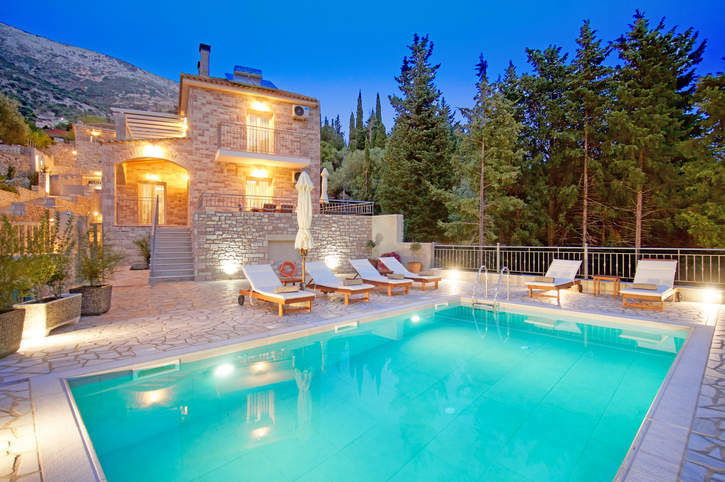 A stunning location surrounded by mountain views and near the picturesque resort of Agia Efimia. Kick-back and relax on one of the sun loungers surrounding the pool while admiring the countryside views. A set of 11 steps lead up to an alfresco dining area - what better place to watch the sunset? There is a BBQ to the rear of the villa on apatio overlooking a small lawn. A sloping driveway leads up to the gated entrance and parking area. The front door is around the corner from the alfresco dining area, 11 steps up from the pool. The lounge is furnished with a comfortable sofa, a feature fireplace and a TV. The exposed stone walls keep the villa feeling traditional. Patio doors open out to the raised terrace with outdoor dining area. The kitchen is well equipped to cater for all your culinary needs. There is also a dining table and chairs where you can enjoy your home cooked meals. Patio doors lead out to the alfresco dining area. On the ground floor there is a double bedroom with patio doors opening onto the patio as well as a separate WC. Upstairs on the first floor there is another double bedroom and a twin bedroom, both with private balconies. These bedrooms have balconies with spectacular views over the pool terrace and mountains beyond. There is also a separate shower room on this floor, as well as a separate shower room on the lower ground floor. On the lower ground floor there is a laundry room and a games room with a pool table - great for some family competition! In a beautiful countryside setting, Villa Joanna has beautiful mountain views across the valley. The scenic resort of Agia Efimia is just 10 minutes' drive away and has a good selection of cafes, tavernas and local shops. The larger town of Sami is the next stop along the coast and a great place to explore. A road runs through the valley connecting Agia Efimia from the beautiful Myrtos Beach and Agia Kyriaki Beach is also within a short drive. Our villa Miranda is next door, further up the hill from Villa Joanna. You'll find a small selection of shops within Agia Efimia, ideal for topping up on holiday essentials. Sami is 20 minutes' drive away and has a large supermarket, butchers, bakeries and many souvenir and jewellery shops - perfect for taking back home as gifts. Relax in the evenings in one of the many waterfront tavernas overlooking the harbour in Agia Efimia. The restaurants here serve some delicious local as well as international cuisine. There is a small attractive pebble bay at the centre of Agia Efimia, overlooked by lush green hills. On your way towards Sami there are several small pebbly beaches and coves - where you might find you have the beach all to yourself! Within Sami, Antisamos Beach is well catered for by beach bars and tavernas at the back of the bay. Top up your tan on one of the sunbeds and parasols available for hire or try some of the water sports on offer instead. This part of Kefalonia is great for water sports, with lots of the beaches offering these kinds of activities. There is a fantastic array of marine life and, consequently, scuba diving sites around this part of Kefalonia. Alternatively hop on one of the daily ferries from Sami to the neighbouring island of Ithaka, famous in Greek mythology as the home of Odysseus. There is a small attractive pebble bay at the centre of Agia Efimia, overlooked by lush green hills. On your way towards Sami stop off at one of the many coves - where you might find you have the beach all to yourself! Within Sami, Antisamos Beach is well catered for by beach bars and tavernas at the back of the bay. Top up your tan on one of the sunbeds and parasols available for hire or try some of the water sports on offer instead. Agia Efimia is a great base for exploring the North of Kefalonia. Head all the way up to Fiskardo and see the scenic Venetian harbour, well worth the trip. Sami is home to Melissani Lake, a natural cave system where sunlight shines through the through the roof of the cavern causing the water beneath to light up. The neighbouring town, Sami, has some fantastic historical attractions such as the ancient acropolis on the headland, overlooking the bay. Walk up to the acropolis and also explore the ruins of the monastery of Agioi Fanentes. You also have the choice of hiring a boat and exploring this pristine coastline by your own accord. Villa Joanna is not available to book for season as it is sold out. Take a look here at the Kefalonia villas that are currently on sale.